After the test of the grand B&W Nautilus 801s, I thought: heck, why not revisit the other side of Bowers&Wilkins' spectrum, the lowly DM-302? After all, this is one of the cheap loudspeakers I like the most, and I even have bought them in the past for, get ready, public address purposes in my professional life, where the little dwarves have to pound out synthesised sounds at shows the size of, er, a Photokina, and as remotely located as Singapore and Taiwan! 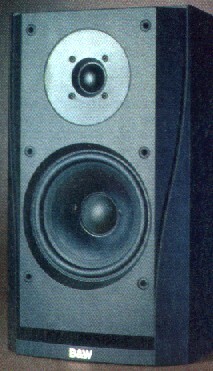 The 302 is seemingly a simple two-way loudspeaker with a rectangular bass reflex port at the lower front. Internally it deviates from common practice by means of B&W's Prism technology: the back wall of the speaker enclosure is entirely covered with long plastic wedges. These break up standing wave patterns between the front and the back of the box, patterns that otherwise would emanate through the woofer cone and result in interference with the direct sound. Or in severe colourations, if you want. The Prism wedges are meant to be most effective in the critical range centered around 1-3kHz, where the human ear is most sensitive. At the back we find one pair of sturdy binding posts. Luckily B&W didn't go as far as wasting money on biwire terminals for this dirt-cheap no-nonsense loudspeaker. One should spend the cash where it is most effective, not? Further thing of interest is a high sensitivity at over 91dB for 2.83V input, at 1 meter. Alas, impedance, while nominally rated at 8 Ohms, dips as low as 3.5 Ohms at some points. So please do not use the 302s with the crappiest of amplifiers: they do deserve something of the caliber of a Rotel 931 or NAD 320. The loudspeakers come clothed in black ash or cherry plastic *veneer*, with a black plastic moulded front and a curiously-sculpted non-intrusive grille cloth. Finish and build standard are of average quality. Nothing to write about, really. These little ones were connected downstream of my main rig, i.e. GyroDec turntable (now with loads of modifications, making it a quarter-Orbe), Planet CD, Quad amplifiers. For reference duties I unearthed by trusty and venerable Rogers LS-1 mini speakers which normally can sound fairly transparent at the end of above system. Of course, with less over-the-top electronics hitting the notes these speakers will sound proportionally less controlled. As I don't have proper stands, I put the test cases on simple homebrew wooden frames. You might think that this invalidates the test. And it does, in a certain way. But on the other hand, one should not forget that most shoppers for speakers in this price bracket are not audiophiles, and hence would use the product without much care for proper placement. So, how do these babies perform then? Right from the onset did these 302s emit familiar and nice sounds. There was quite a lot of bandwidth, and dynamics weren't exactly downplayed too! The sound was full-blooded, vibrant and energetic, resulting in instrumental lines that were very easy to follow, though perhaps even highlighted a bit. The general tonal balance was quite even, maybe with some excess brightness (see the above note on exaggerated detail), but most certainly not thin-sounding. If anything, the 302s were full sounding. There were NO serious large-scale colourations, but instead there seemed to be a thin layer of cheap-speaker-sound, a kind of roughness, all over the frequency spectrum. This is not as bad as it sounds, and while not entirely neutral nor transparent, the B&W DM-302 sounds very consistent over the full spectrum. Turning to the Quad ESLs for reference gave a less dynamic, less busy sound, of course with a great deal more of finesse and refinement. Listening to my old Rogers LS-1 minispeakers, a more natural competitor to the B&Ws due to their equal dimensions and similar driver complement, brought a kinder and more neutral sound, which was smoother and nicer, but also this was a sound marred with a large smack of nasality in the low presence regions which manifested itself on strings. Here the B&Ws most certainly sounded more balanced. Perhaps the Rogers' bass was a bit more detailed, but then the B&Ws' was a bit deeper. And anyway, in this particular area the differences were small, and both speakers performed acceptably. Overall I preferred the sound of the Rogers, but then only on music that did not reveal that nasality too much. If this condition is not fulfilled, then it is the 302 for me! Yet, my ex-musician-but-no-audiophile wife outright liked the B&Ws more, which, if anything, tells us that both speakers perform at the same (high) level of quality. So, in short: the 302s made a lot of good music, which makes them highly recommended for budget systems, especially given their very low cost.